Congratulations – you’re ready to propose! How will you pop the big question to your beloved? How will you select a ring she’ll adore that matches her personality and lifestyle? Allow us to help inspire you with ten amazing proposals and the perfect ring for each one. Commitment. Eternal. Remarkable. Your sweetheart and you have talked about a future together, so you know she treasures commitment and lasting love with you. Nothing says eternal love like a beautiful timeless Diamond Ring. Use nature's elements to plan your proposal—sand, for the passage of time; a rope made of natural fibers, for strength; and sea shells, for life’s journey. Plan a beach weekend with your sweetheart, and buy some rope and sea shells ahead of time at a craft store to take with you. Once at your destination, ask your sweetheart to meet you for a walk on the beach at a certain time. Find a relatively private, sandy place where you can write, "Will you marry me?" in the sand with a sturdy stick. Then, decorate your message with your rope and shells. Soon after, return with your sweetheart to this location, and offer her the diamond engagement ring as she looks upon your message in the sand. Timeless. Classic. Graceful. Your beloved possesses all of these qualities and more. For her, the Solitaire, with its standout single diamond and understated but elegant band, is the perfect choice. Set the stage a few weeks prior to your proposal by suggesting that the two of you start a monthly tradition of staying at home and relaxing for a Classic Movie date night. Once you pick a date for your first movie night, casually mention that you haven’t seen Breakfast at Tiffany's in years and would love to start with that movie. Remember how Holly Golightly, the movie’s protagonist, wanted to engrave the ring prize she found in the Cracker Jack box? Let life imitate art as you have some Cracker Jack bags on hand while you watch the movie. When the movie ends, have fun comparing your Cracker Jack prizes, and then tell her, "I think you were meant to have this one, too," as you hold up the sparkling Solitaire ring. Feminine. Dramatic. Magical. Your dearest likes to turn up the volume on life! She has a flair for making the small, sweet moments you share feel like a big celebration. For your shining star, a Halo engagement ring can help turn up the volume on center stage. The ring is designed to give the illusion of size, echoing her larger-than-life personality while complementing all of her natural beauty with its own. 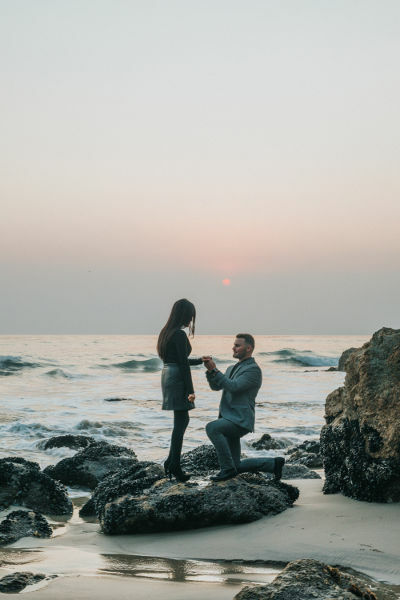 For this proposal, you'll need to shop online or visit a magic shop to buy a "flowers from fingertips" magic trick that makes it look like you are pulling endless flowers from your fingertips. Familiarize yourself with the instructions for making this trick work, and then practice the trick until you are comfortable with it. Then, one evening as you are relaxing together, casually tell her, "I've been working on a magic trick. May I perform it for you?" Then, start the flower-pulling trick. End your trick by taking a bow and then pretending to pull one more flower from your fingertips, but pull out her Halo engagement ring instead. Colorful. Full of life. Cheerful. Surprise your darling with a ring as bright and joyous as her. For your girl, a Canary yellow diamond engagement ring is the perfect way to say you don’t want the sunshine in her smile to ever set on you. Make a reservation at a local painting venue, such as Painting with a Twist or Pinot’s Palette, where you can bring your own drinks, glasses, and snacks. Bring along some sparkling wine or champagne and some chocolate-dipped fruit. As you are snacking and painting away, casually comment about the vibrant colors you are using and how they remind you of her. Then, propose a toast to her. Make sure to place the Canary yellow diamond engagement ring in one of the glasses beforehand, so she’ll be sure to notice the extra sparkle in her bubbly when you hand her a glass. Sentimental. Romantic. Devoted. Your sweetheart saves tickets from every movie and concert the two of you attend, and she remembers what you were wearing on your first date. She appreciates the little details and will fall in love with the poetry of a three-stone engagement ring, with one stone for your past, present, and future together. Go restaurant-hopping to three places -- one for an appetizer, one for an entrée, and one for a dessert -- where you dined early on in your relationship. Talk about what you remember on those occasions, your impressions of each other at that point in the relationship, and how you have grown together since then. When you get to the restaurant for the dessert course, present her with the three-stone engagement ring and say, "I don’t believe this was on the menu the first time we went here." A go-getter. Productive. Self-starter. Your beloved is on-the-go and full of ideas as she navigates a packed calendar. She definitely knows how to make each precious moment of your relationship count. When every moment counts and you don’t have a second to lose, an engagement ring with the center-stone included is the answer to starting the next phase of your relationship. These best-sellers are ready to ship, so grab one and be on your way to proposing. The next time your beloved goes out-of-town for work or a conference, surprise her at the airport of her final destination point. When she sees you at the airport, hand her the center stone included engagement ring and say, "I think you forgot this." Regal. Resilient. Striking. Does your dearest adore the British Royal family? Can she recite every episode of Downton Abbey almost verbatim? A deeply-hued sapphire just might be her cup of tea. Often the preferred engagement stone of royalty, a sapphire engagement ring will delight followers of the British Royals and Downton Abbey fans alike. Treat your dearest to a fancy afternoon high tea ceremony at a hotel or restaurant. While she is sampling the finger sandwiches and scones with clotted cream, pass her the sapphire engagement ring on a napkin and say, "I wonder what’s in this one." 8. The Gemstone Engagement Ring: My Color or Yours? Vibrant. Symbolic. Memorable. Does your darling love her birthstone color so much that she wears it all the time in her clothing, makeup, and accessory choices? Perhaps she loves your birthstone color so much that she also wears it as much as possible because it reminds her of you. A gemstone engagement ring with a center gem in her birthstone color and two side gems in your birthstone color would be especially meaningful to her. Tell your darling that you are thinking of repainting a room or part of your apartment or home and would like her help in selecting the perfect color. Before you visit a local paint store, research colors of paint that most closely resemble both of your birthstone colors. Take a trip together to the paint store and have fun browsing the multitude of paint samples. Then, say to her, "I think I've narrowed it down to two choices." Show her two paint samples with your birthstone colors, and present the gemstone engagement ring to her as you say, "You make my world so bright." Glamorous. Stylish. Enduring. If your sweetheart treasures family heirlooms or adores all things that are vintage or nostalgic of a bygone era, a vintage-inspired engagement ring is bound to make her feel cherished. These rings have antique-inspired details and timeless designs such as scroll motifs and elaborate settings that recall past eras. There's no better way to step back in time to a glamorous era than a quick weekend getaway to Los Angeles to experience some of that Old Hollywood appeal. Your sweetheart can channel her inner-Claudette Colbert or Greta Garbo as you make your way to the Hollywood Museum on Highland Avenue to check out the vintage memorabilia and the current exhibits. As you stroll around the museum, surprise her with the vintage-inspired engagement ring as you tell her, "You'll always be my leading lady." Fashionista. Independent. Innovative. Your beloved has an eye for fashion and always finds fresh, new ways to use clothes, accessories, and other fashion items. She loves to collaborate with you on decisions you make as a couple, and you know she’s brimming with unique, amazing ideas about the look of her engagement ring. Our custom design ring will let her creativity soar and ensure your darling has a ring that's unique, personal and unforgettable. Make Friday night dinner reservations for the two of you at a romantic restaurant. The night of the dinner, as you are driving the two of you to the restaurant, tell her that you have to pick up something along the way. Make your way to our 6222 Richmond Avenue address, and hold her hand in yours as you arrive at our 5th floor office in front of Suite 570. When she notices the name on the door, and asks you what you need to pick up at Inter-Continental Jewelers, it's time to pull aside the curtain and let her know. "Nothing yet, but tonight I want the two of us to design your engagement ring together. Will you marry me?" The promise of such a wide range of customization usually comes with a steep price, but at Inter-Continental Jewelers we have all of these and more at affordable prices, plus the guarantee that all of our center diamonds are GIA-certified.